IN 1996, when Microsoft was still ahead of the big technology trends, it launched a small brand called Expedia Travel Services. It hoped to persuade customers to book holidays online. It was not an immediate success. Few households had an internet connection then and, just as importantly, most people thought the idea of buying a holiday through the ether (not to mention typing their credit-card details into a web browser) plain foolish. Few think the idea crazy now. 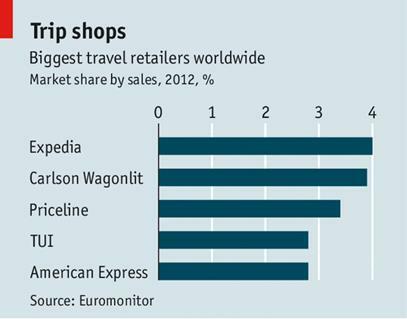 Expedia, which Microsoft sold in 2001, has become the world’s biggest travel agent (see chart). Last year, through brands such as Trivago, Hotels.com and Hotwire, as well as its eponymous operation, its gross bookings were $39.4 billion. The third-largest travel agent is also an online firm: Priceline, whose brands includeBooking.com, made reservations worth $39.2 billion in 2013. Last year online travel agents (OTAs) had combined bookings of $278 billion, according to Euromonitor, a market-research firm. Indeed, when it comes to reserving flights, hotel rooms and rented cars for holidaymakers, the online-travel market looks quite mature in many rich countries. PhoCusWright, another research firm, reckons that online booking now accounts for 43% of total travel sales in America and 45% in Europe. Since much of the rest is accounted for by business trips handled by specialist corporate-travel agents such as Carlson Wagonlit, scope for the OTAs’ market to grow seems limited. That explains Priceline’s purchase, announced on June 13th, of OpenTable, a restaurant-reservation website, for $2.6 billion: it sees this as a way to earn commission on another chunk of tourists’ spending. There are some big markets where online bookings have yet to take off. Germans still typically arrange their holidays through traditional travel agents. Although the Chinese now spend more on travel in aggregate than any other country’s population, in 2012 they booked only 15% of their trips by value online, says PhoCusWright. It thinks this will rise to 24% by 2015, making the Chinese online-travel market worth around $30 billion. Much of the expansion will be driven by ambitious local firms. Ctrip, the biggest, makes most of its money from air tickets and package tours to Greater China. But as Chinese tourists become more intrepid—ranging farther afield and no longer shuffling around in big tour groups—online hotel bookings are becoming more important. Ctrip’s hotels division has grown at an average of 25% a year for the past five years, according to Trefis, a stockmarket-analysis firm, and had revenues of $366m in 2013. It will not be long before it eyes Western markets more keenly. So besides Ctrip, perhaps the biggest threat to the big two OTAs is TripAdvisor, a popular travel-reviews site spun off by Expedia in 2011. This month it said travellers would be able to book hotels directly through its smartphone app. Weeks before Priceline’s deal with OpenTable, TripAdvisor announced it was buying La Fourchette, another online restaurant-booking service. The online-travel market is consolidating fast, but so far holidaymakers need not worry about a lack of options.